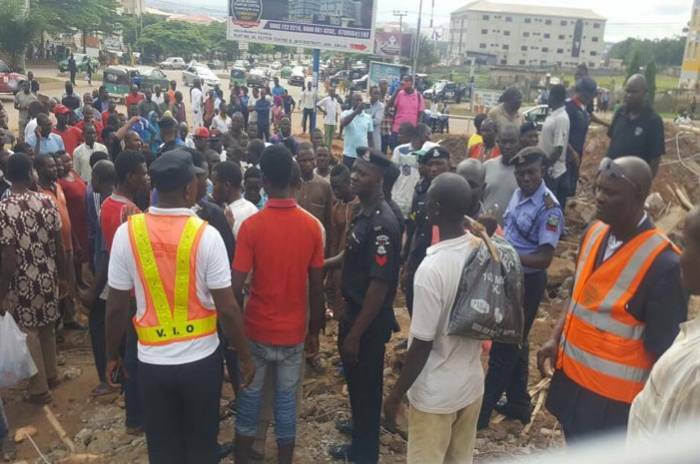 A body has been found under the rubble of the four-storey building which collapsed in Jabi, Abuja on Friday bringing the casualty figure to three. Aliu’s corpse was about being evacuated to the morgue when his relatives insisted on interring him at the cemetery in accordance with Islamic rites. Six injured persons and one dead victim were evacuated from the site hours after the structure came down, while another worker who escaped with injuries later died of internal wounds at Gwarimpa General Hospital. The FCT Minister, Mallam Muhammad Bello, had directed the rescue team to resume operation at the site following concerns that there could still be victims under the rubble. The Federal Capital Territory Administration and the National Emergency Management Agency had on Saturday ended the rescue operation after six injured persons and one corpse were evacuated. The site engineer, Friday Alu, who was rescued on Friday, was said to be in the intensive care unit at Cedarcrest Hospital, Apo. It was learnt that the FCT Emergency Management Agency officials were not allowed access to him when they called to know how they could be of assistance. It was further gathered that the other four victims who sustained minor injuries had been discharged from Gwarimpa Hospital where they were taken to by relatives and friends.